Royal USA Tours & Transportation INC.
Big Blue Royal Trolley Tour! 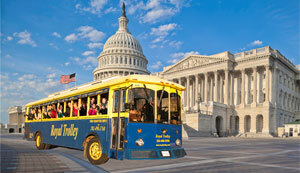 Our biggest trolley will take you around DC with the wind in your hair. Open-aired (but heated in the winter), our trolley's are the best way to get an unobstructed view of Washington! An expert driver tour guide takes you around the city narrating the entire way. 20% gratuity is added at the time of payment.